Two weeks ago I watched the French movie Yves Saint Laurent (directed by Jalil Lespert and starring Pierre Niney and Guillaume Gallienne). The actors’ performance is beyond amazing. Go see it when it’s out in your country, seriously!! 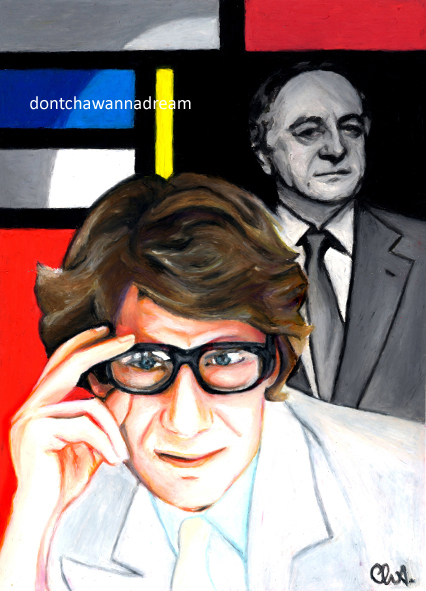 I couldn’t paint someone else, it had to be Yves Saint Laurent and Pierre Bergé. I wish I had more time to write this post but you get it, this painting means a lot to me because 1) it’s for my first exhibition EVER, 2) these men are BRILLIANT, 3) it was a huge challenge : I really had to think to make this composition. It’s not just a “portrait”. It has a meaning. Actually I was abroad sooo no pictures of me and the painting. After Planet We Care… Planet Sincere. ’cause we always are. We……. That’s really great, Cha. Congratulations on your first exhibition! That’s huge. I think that will be a great opportunity to get the exposure your work deserves. And you’ve really got these two down perfectly (I looked them up!). Felicitaciones Cha por esta primera exposición. Te deseo un lindo fin de semana. That’s pretty good but you should have been number one! They must not have counted the important votes! Thanks for believing in me, Peter!! Fantastic news Cha! Congratulations, your work is wonderful so it doesn’t surprise me that you placed. Hey, congrats on your first exhibition! Nice piece! Well to be honest, it was a normal day for me (which is sad I guess) but I was still on vacation. Hope you had a great weekend. Thanks again for your comments. That’s so kind of you. I don’t know if I can forgive you, Nuno… ahahah thanks a lot!! Have a great weekend!!! I think the composition is spot on. I’d hang a painting like this. Congratulations!!! !